I have heard great things about this book, but I never expected to like it as much as I did. 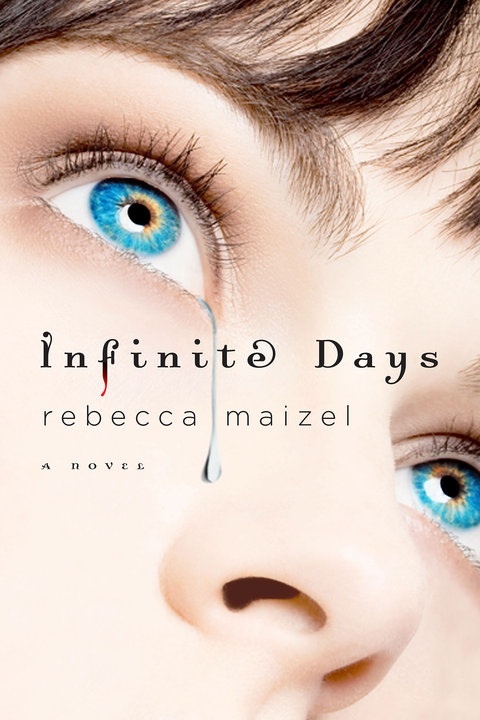 Stories like Infinite Days are proof that the vampire trend is here to stay. When done correctly, a good vampire novel is enthralling and captivating. I was swept away from the first page of this book, and I didn't get up from my couch until I finished it! Lenah has been a vampire for 592 years. Above all else, she wants to be human again. She wants to breathe, walk in the sun, experience the senses of taste and touch, and most of all, be free from the never ending mental anguish that vampires experience in Maizel's world. Lenah gets her wish at the cost of her best friend's sacrifice. What follows is her attempt to assimilate into human society at a boarding school. She has to keep her past a secret and learn how to be a regular teenager. Lenah knows that her vampire coven will come for her, and she is constantly looking over her shoulder, aware of the danger...until she gets so caught up in the experience of human life that she forgets about her past. Lenah meets two very different guys and has to choose between them, all the while haunted by her best friends' sacrifice to make her human. I found myself rooting for both of Lenah's guys---it was a very tension-filled love triangle. I'm going to stop here, so as not to give anything away. The book's ending left me dying for more (pun completely intended, I'm a dork like that). Infinite Days is the first in a trilogy, and I cannot wait for book two: Stolen Nights, out in 2011. If you're tired of the typical vampire books, I would give Infinite Days a try. It's a refreshingly original and different take on vampires. I'll never think of vampires the same way again! I wish I would have bought this book for my nook, because the print on my soft-cover copy was pretty small. By the end of the book, my eyes hurt. Of course, that could also be due to the fact that I sat and read for four uninterrupted hours! The new spin on vampires: their feelings, desires, lives, the magic surrounding their existence, everything was so well-thought out and well-done. Maybe: it's no more graphic than Vampire Academy. I loved the vampire mythology of this book and how it wasn't afraid to go dark. But I wasn't as fond of the boarding school aspect. I thought it played into too many stereotypes of mean girls and I wasn't a fan of Justin. So this was a mixed bag for me, but good enough that I can't wait for the next one. I agree about the boarding school aspect of this book. I thought that she easily swooonwed over the guy in the book , and left more questions about her first mate. I liked this one - it's a good debut and a different spin on all the usual vampire stuff. However, the relationship between Lenah and Justin didn't work for me at all. I hope she dumps him in the next book. ha! I have had my eye on this one for while! And I agree, vampires are here to stay. 5 by 5! And the great things I keep hearing about this book continues! If you only grip was the small print, then wow! Now I'm curious about the new spin on vampires, must read this soon. Thanks Kelli. You know, I have looked the other way every time I saw this book. But when you say "tension-filled love triangle" that makes me want to read it. Adding it to my TBR list. I saw this one at Indigo last month... walked right by it... BIG MISTAKE! Now I have to go back and hope they still have a copy. Great review and what a rating of 25 on 25! I know this one must be GOOD. I really enjoyed this one as well, but I just could not warm up to Justin at all. I loved the fresh take on vampires though and I'm looking forward to the sequel. Great review!